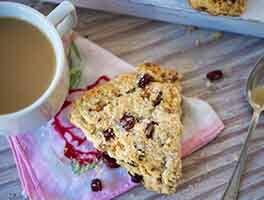 Sweet tender scones packed with whole grain goodness, nuts and tangy orange peel. These scrumptious scones are topped with a sweet glaze with the unique citrus taste of Fiori di Sicilia, a definite show stopper that will keep you coming back for more. See step by step photos and helpful hints on our Flourish Blog. 46 mins. to 55 mins. Preheat the oven to 350°F. Place the walnut pieces on a dry sheet pan and toast in the oven until lightly browned and fragrant. Set aside to cool. Place the flour, brown sugar, baking powder, and baking soda in a large bowl. Whisk well to combine. Add the walnut pieces and candied orange peel to the dry ingredients and toss to coat. Cut the cold butter into small pieces and add to the bowl. Toss to coat the butter pieces. Working quickly, press the pieces of butter between your fingers to create "leaves" of butter. These leaves will create a lovely flakiness in the scones. In a measuring cup combine the buttermilk, egg and flavorings. Lightly beat with a fork to break up the egg. Pour the liquid all at once into the dry ingredients. Mix gently just until well combined. Overmixing will result in tough scones. The dough will be quite wet at this point. Cover the bowl with plastic wrap and refrigerate for 15 minutes. This rest will give the whole wheat flour time to hydrate and absorb the liquid without adding more flour. Remove the scone dough from the fridge and drop by using a 1/4 cup measure onto a greased or parchment lined baking sheet. Leave at least 2 inches between scones as they will spread a bit. Bake for 16-18 minutes or until lightly browned. Remove the pan to a cooling rack to cool while you make the glaze. Combine the confectioners sugar, heavy cream and 2 -3 drops of fiori di sicilia until smooth. Add more cream if needed to make a spreadable consistency. Spread the glaze over the slightly warm scones and serve. I didn't intend to make changes to this recipe, but I misread the ingredients and had to improvise. For that reason, I'm not giving any stars but I thought I would share my experience. I thought it called for orange zest instead of candied orange peel, which I didn't have and didn't have time to make. So, I subbed chopped cranberries and a little additional brown sugar and added the zest of two mandarins. They turned out great. 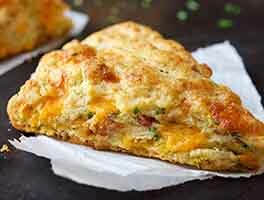 These scones are delicious! I love that there is less sugar. 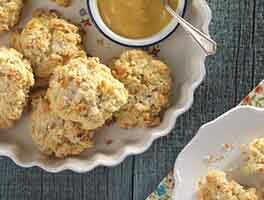 Everything about this recipe is outstanding -- especially the scones' flavor! Dough was only slightly wetter than typical scone dough; after 15 minutes of refrigeration, the scones were easy to drop using a muffin scoop and kept a beautiful shape. 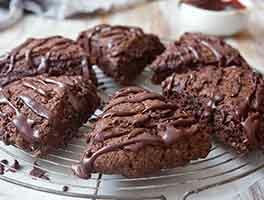 My wife and I baked this recipe today and it is WONDERFUL. It is the first KAF recipe we have tried. My wife reversed the order of adding the walnuts and candied orange peel to the dry ingredients and added the butter first. She keeps the butter in the freezer at all times and she had me take one stick and shave curls off of it for easier incorporation into the dry ingredients. After fluffing the butter with the flour, she paused to run her hands under cold water, patted them dry and then used both hands to quickly pinch the butter into the flour while constantly fluffing and churning it for a few short minutes. Then she added the candied orange peel and walnuts, mixing them in and followed the recipe exactly after that. The scones are SO delicious. They're the best we've ever made. She made them for me with love. Congrats on a wonderful recipe and a tremendous website. These make the house smell so good, and everyone loved them. My babies each ate 2 apiece for breakfast. 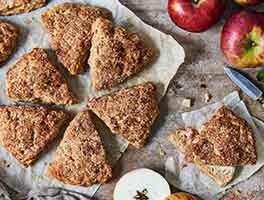 Delicious, easy, and I feel good about giving my family a treat that is whole grain, and not too much sugar. Awesome, will make often. After adding wet ingredients, it was a little dry. I had to add more buttermilk. Instructions said it would be quite wet until flour had a chance to absorb liquid. It was not specified, but maybe I should have sifted the flour?? Flavor was excellent! Fiori di Sicilia is wonderful and versatile. I add miniscule amounts to chocolate, whip cream, custard depending on what I'm looking for. Not too be missed!